Join the adventure of a small car from France, it's initiation journey across Australia, the transformational painting and how it joined jets on the tarmac in Sydney. Decades on and back home, it is still doing its magic. 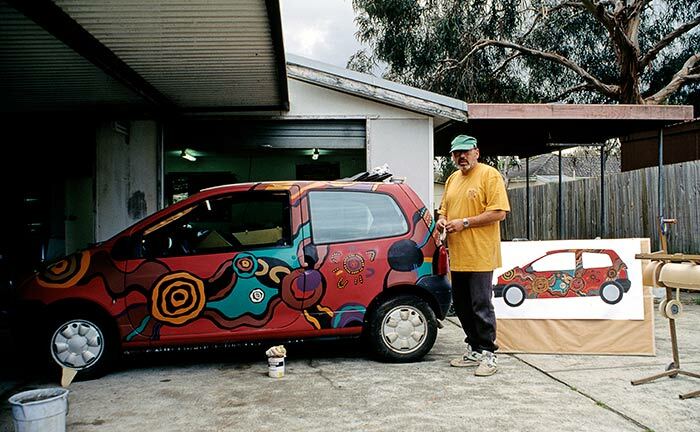 It was 1994, and Frenchman Jean Dulon had a crazy idea: what if he convinced French car-maker Renault to give him a brand-new car, took it from France to Australia and painted it with an Aboriginal design? Let's rewind. A year earlier Jean was a journalist who loved to travel. He wanted to see Australia and create a documentary about the country. But how? Travelling was expensive. He shouldn’t worry. His stars would align beautifully very soon with two events. On 23 September 1993, in Monte Carlo, southern Spain, Sydney was chosen as the host city for the 2000 Olympic Games. And in October that year Jean visited the Paris motor show 'Mondial de l'Automobile' where he saw the newly released Renault “Twingo" for the first time. He liked the car, it reminded him of the popular Minis and VW Beetles that were buzzing and crawling all around Europe. Suddenly it dawned on him what he needed to do: What if he brought together Australia and the Twingo? David, the tiny 2-wheel-drive car, against Goliath, the unforgiving, vast, oven-hot continent? Maybe he had seen The Love Bug, a 1968 film about a VW Beetle that just kept surviving whatever its journey threw at it, even after it was cut in half. What if...? The Twingo, very much like the Beetle, consisted of mostly standard components, was small in size but flexible enough for you to sleep in, low on fuel consumption, ... His head started to spin into a dreaming. He pictured himself in a new country, full of promise, filming and exploring. He and his Twingo presenting Australia! But some things were still missing: If this was to become a project, it needed a soul. And a car. This adventure of a lifetime had to be linked to the heart of Australia, the core, its Aboriginal people and their culture. The car would have to be painted in the colours of Australia's earth to become, in a way, indigenous. As it goes with soul projects, the universe responded. Jean met a journalist who had just written an article about Australian Aboriginal artist John Moriarty, founder of the Balarinji Design Studio, and now most famous for painting two Qantas jets with Aboriginal motifs (Wunala Dreaming and Nalanji Dreaming). Jean grabbed the opportunity and got John’s details and called him straight away, explaining his vision and suggesting to meet him in Australia. After hearing his story, John agreed to meet him in Australia. Now Jean also contacted Renault, the French car manufacturer, since he needed to organise a car. Surprisingly, he was able to convince a marketing manager that a brand-new Twingo should discover Australia and visit the oldest culture in the world. The closest car they could find was in Noumea, New Caledonia, about 2,000 kilometres north-east of Sydney. There it was prepared for its dusty journey on unsealed roads and tracks: kangaroo bar, special tyres and a steel plate to protect the chassis and steering box. In June 1994, Jean and his left-hand-drive car landed in Sydney to travel on to Adelaide where he met John and his partner Ros a few weeks later. Over dinner Jean revealed details of his plan and showed sketches of the design he wanted to apply to the car. John was impressed and offered his support for the project. But he had two conditions. Like an initiation, Jean needed to travel across the vast land with his unpainted car. Secondly, he had to visit Borroloola in the Northern Territory where John was born and lived. This was so Jean could understand the land and listen. “Go there so you can hear the words and feel the spirit of the ancestors,” John advised, “only then can you receive the gift of Balarinji and the meaning it represents." So Jean began his epic journey by travelling north to Uluru before turning west and crossing the desert on the Gunbarrel Highway, an isolated desert track in the Northern Territory, with heavy corrugations, through stone, sand and flood plains. He passed through the Aboriginal communities of Warakurna and Warburton in the Goldfields of Western Australia before reaching the coast at Esperance. He drove his little initiation candidate to Albany and from there to Western Australia's capital, Perth. The North-Western Coastal Highway took him to Broome and the Kimberley. After crossing into the Northern Territory near Kununurra he followed the Carpentaria Highway until he finally reached Borroloola to meet, and spend time with, John. By then Jean was transformed. He felt he had become a part of Australia, a feeling that echoed in the connection he felt with the land and the people he had met who had welcomed him. He concluded his journey with a trip to the Cape York Peninsula. Then, after more than two months and over 25,000 kilometres, Jean returned to Sydney where John was already waiting. The artist had prepared a new set of drawings. How beautiful they were! 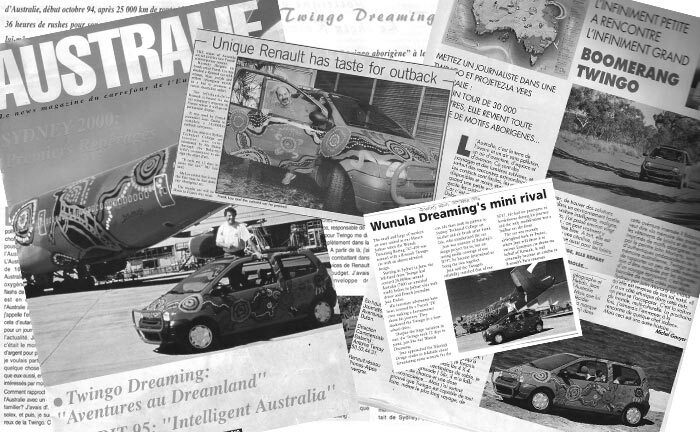 The men agreed, and over the next fortnight a little Twingo was transformed to proudly wear a Balarinji Dreaming. It's initiation was complete. At the same time, somewhere in Sydney, another incredible transformation happened, but of a gigantic object and with much more secrecy. On September 4, the little car met the giant who had emerged from the workshops of Australia's national airline, Qantas. 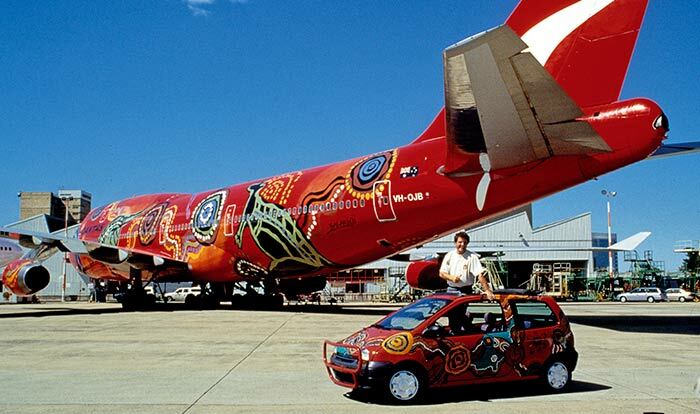 Inconceivable today, on the tarmac of Sydney airport, the Wunala Dreaming Boeing 747-400 Qantas jet, also painted with a design by John, stood side by side with its little brother, a tiny Renault Twingo. "This is a visual signature for a young nation born of an ancient continent," mused Ros Moriarty, proud of her husband's work. Then it was time to take the car back to France. After all, Renault wanted a return on their investment. And the company knew what to do with their little star. It celebrated the Twingo as an iconic Renault, with a national publicity campaign on billboards, in magazines, press articles, radio interviews, a documentary of the adventure and a live TV show with Canadian singer Céline Dion. Press clippings of the Twingo story. The press celebrated the unique car in both France and Australia. After all the attention had died down, he was reunited with his trusty Balarinji Dreaming car which he is still driving, since more than 20 years now, and “almost every day,” as he says proudly. And almost every day people smile as he passes by, give him the thumbs-up to show their approval. 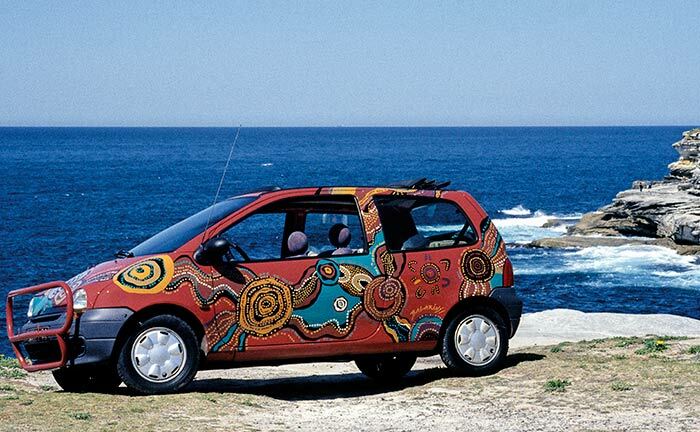 This special little Twingo continues to give joy and inspire, send a message of peace, openness and tolerance, and showcase Aboriginal art more than 15,000 kilometres from home. As if by magic, not a scratch has damaged its paintwork, as exposed as it has been to many curious souls for the last 20 years, and with 300,000 km travelled all across Europe. "20 years of positive interaction all over Europe, with thousands of people and thousands of kids moved by the design and the painting, 20 years of smiles and chats..., 20 years of conscious or unconscious connection to Australia and its culture," says Jean with great satisfaction, and adds with surprised realisation: "People could feel an emotion, a soul and a spirit... emanating from a car!" It appears the spirits of the ancestors are looking after their messenger so it can tell of its journey and the spiritual land called Australia. As told by Jean Dulon. Written by Jens Korff, Creative Spirits. Jean shares a gallery and some information on his website.